Each year it just gets bigger and better: The Texas Veggie Fair. 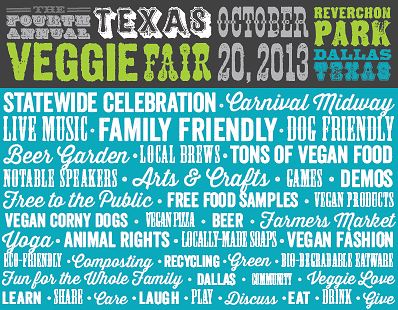 A fair designed for DFW vegans, vegetarians and those in support of. On Sunday, October 20th, (from 11am to 6pm) North Texans will gather once again at Reverchon Park in Dallas for this remarkable, FREE event promoting the vegan/vegetarian lifestyle! We promise the food will be just as delicious as your regular State Fair of Texas, but just within a more intimate setting than Fair Park. It only provides a sample of what’s available in the “Vegan” North Texas world though and please note that TVF is a one-day event. 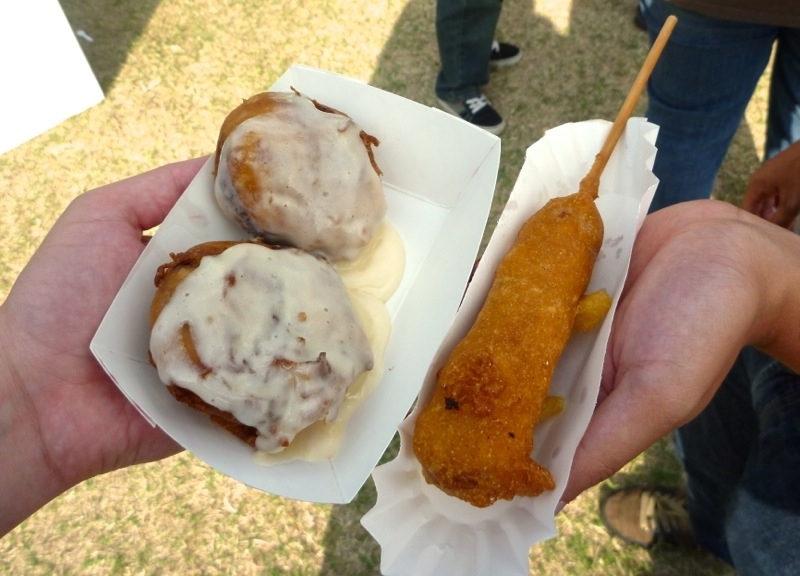 After sinking out teeth into the veggie corny dog and the oh-so-amazing fried cinnamon roll (both pictured below) at last year’s Veggie State Fair of Texas it’s a MUST that we go back! Not to mention, Erykah Badu, is expected to do some DJ-ing at the event. You can catch her Saturday, Oct 19th at the Lamar Street Festival. 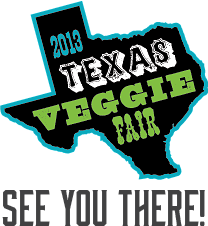 Then check for @fatbellybella herself on Sunday at the 2013 Texas Veggie State Fair. At one event (the music festival) you’ll see the artist doing her typical song & dance, and at the other event the well endowed Dallas Diva can be caught using her alter ego to DJ in the park! While fair food is quite a draw, this outdoor festival covers everything vegan/veggie related: vegan products, animal rights, recycling, yoga, product vendors, bio-degradable flatware, chef demos, speakers on plant-based diets, locally-made soaps and more! It’ll be exciting to see live music added to the lineup this year. The list of vendors and exhibitors continues to grow each year! For all other information on the 4th Annual Texas Veggie Fair click here to visit their official website.